OK, kids, I’ve finally cracked the code on how to convince your parents to do whatever you’d like. I know you don’t use Facebook, but your parents do and that’s the key. I was reading a recent story about how a guy advertised directly to the CEO of Reddit and it got him a job interview. Combine that with how effective Russia has apparently been in manipulating people via Facebook, and voila, you can covertly convince your parents that you are right. Now, for example, let’s say you like playing Fortnite, I mean who doesn’t. But your parents aren’t so hot on the idea. They have heard about violence and addiction and who knows what else… Well, let’s change that. You need a Facebook account, you probably have one, or know someone that could be convinced to join your campaign. Now you need a Facebook ad account. You will need to create a custom audience for your ad. You need to use as many specific things about your parents as possible. (This shouldn’t be an issue, because you love them so much and know everything about them.) I worked on creating a custom audience aimed at myself. Facebook said the target audience was 100-640 people but I am pretty sure it would just be me based on the interests/demographics I selected. Then put about $5 towards the ad and encourage your parents to spend some time on Facebook. 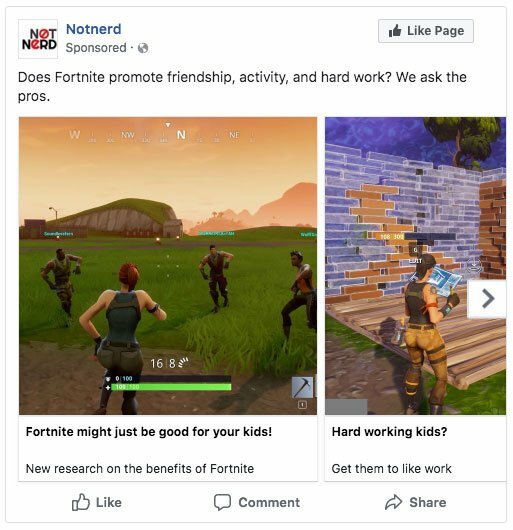 Once you check the results of the ad and see some people saw it and maybe even clicked the link, you can casually bring up the Fortnite conversation once again. Note: Results may vary, but I am doing what I can to help. Also Note: This example is a good reminder to think twice before you believe everything you see on Facebook or the internet for that matter.